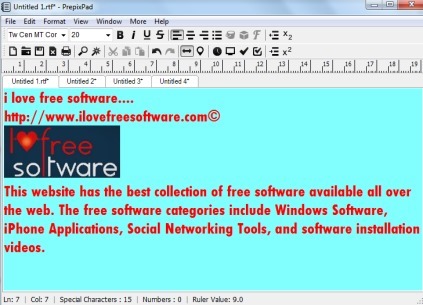 PrepixPad is a free text editor that helps to create and edit plain and rich text files. You can open multiple tabs on its interface to work with multiple files. It is a feature rich text editor that comes with text to speech feature, source code editor to edit programming files, case converter, lets you insert images/special characters/URL in text files, customize text color, and background color. 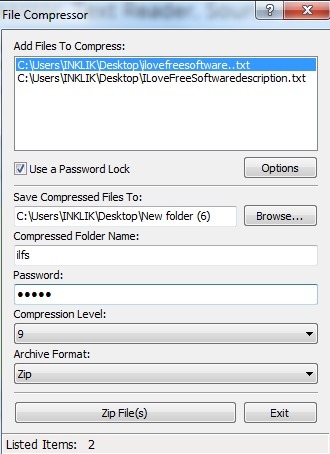 Some of its unique features, that you won’t find in many similar software are: file compressor to compress your text files, merge multiple text files, append a file with current file, protect file and folder, capture current tab as an image file, etc. All these handy features give it a good stand in text editor software category and therefore it is a worthy software to use. In above screenshot, you could see its main interface where multiple menus are available to access and use its features. How To Use This Free Text Editor? PrepixPad comes in both installer version and portable version. Microsoft .Net Framework 3.5 is needed to run it successfully. You can find the download link placed at the end of this review. On its interface, toolbar, format bar, and menu bar are available. Menu bar is the most important part that lets you ease your work and access all the handy features of this free text editor. File menu is one of the essential menu that is helpful to open a new tab/file, create a clone tab of active tab, insert multiple files to merge them as a single text file, upload files to FTP server (requires Host URL, username, and password), and to save files as pdf or as rtf format. 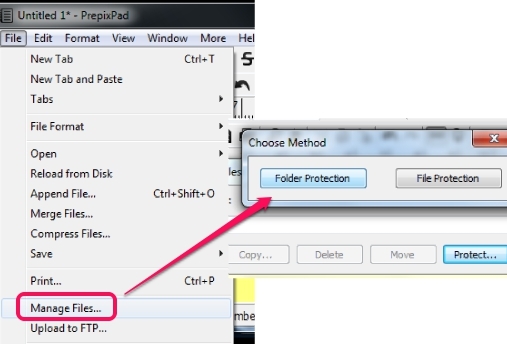 This can also be used to protect any file or folder available on PC, without any password. No one will be able to open protected files or folders, until it is unprotected back using this text editor. Apart from these valuable options, there is Compress Files option also available. Whenever you have to zip multiple text files, you can use this option. This is not just an ordinary text archiver, because it supports password protection, compression level (0-9), and multiple archive format (Zip, GZip, Tar, LZW, and BZip2). This menu contains many useful options. Whether you need to listen to written text, have to insert special symbols/images/URL to text file, start spell check, convert selected text to lower case, sentence case, title case, reversed case, or to find & replace words, this menu is helpful. 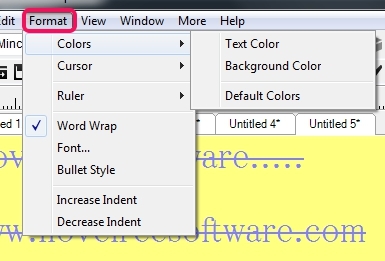 To change text color and background color of any tab or to customize font size/style, use this menu. Word Wrap option can also be enabled/disabled from here. This menu is used to access source code editor to edit programming files. It provides a separate window for source code editor so that you can edit and save your C#, VB, HTML, JS, SQL, and PHP files. Apart from this, it can help you to start Google Search, Yahoo Search, Wikipedia Search, and Ask.com search for a selected word or line. Another unique option present in this menu is that it can capture your currently active tab and can save it to bmp, png, or jpeg image format. 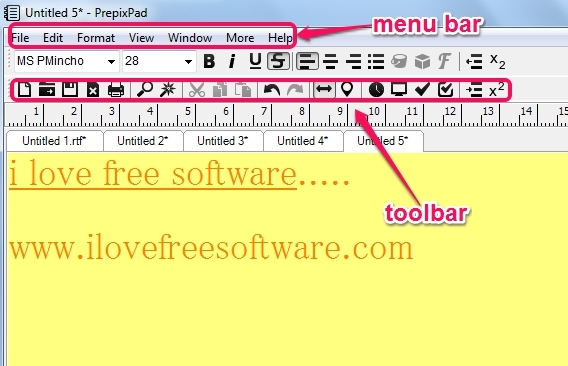 PrepixPad is one of the best free text editor and also very easy to use. It contains almost all the features that should be present in a text editor. I can wholeheartedly recommend it to you. Similar Software: EditBone, AkelPad, Writer 42, and Bell Word.